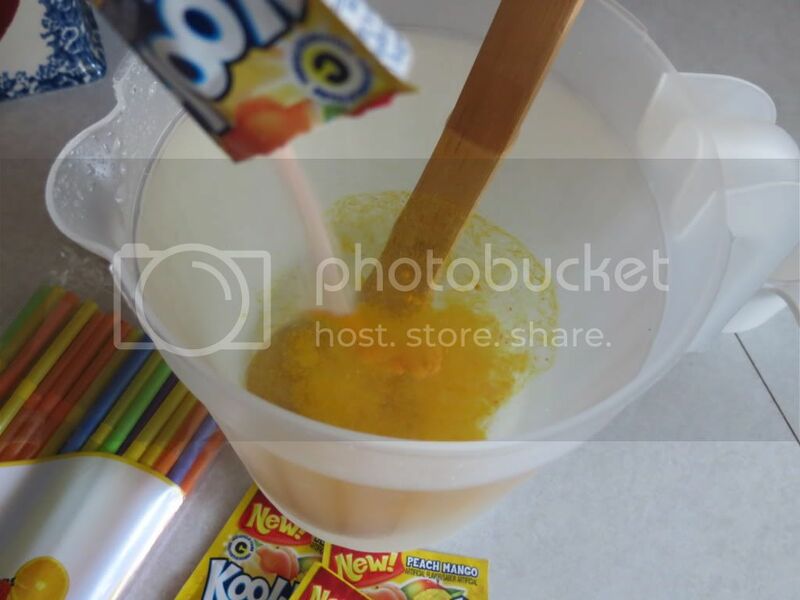 Peach Mango Kool-Aid + Bonus Bendy Staws! Want to know how I know its almost officially Summer Time outside again? Because there are new flavors of Kool-Aid out on store shelves! I've long since said that Kool-Aid is a drink that is best enjoyed during the Summer months and its hard to dispute that fact. Nobody drinks hot chocolate in July just the same as nobody drinks Kool-Aid in December. Its some sort of mystical law of the seasons that everyone adheres to without really realizing it. 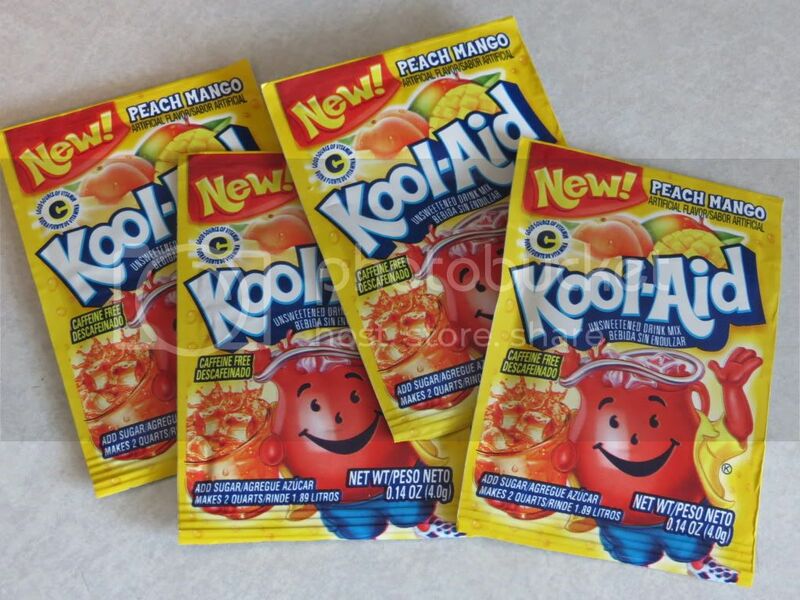 The newest edition to the Kool-Aid family is a flavor for 2012 called Peach Mango. A combination of well... peaches and mangos. This is not as earth shattering as last Halloween's surprise appearance of Scary Blackberry Ghoul-Aid but its not meant to be. This is Summer Time.... the season for relaxing and... peach flavored drinks. I bet this would be great with Vodka. Peach Mango is sold in your standard, run of the mill Kool-Aid package. This sort of bums me out. I miss the old days when each package was like a little mini piece of artwork. They all looked different and felt different. Kool-Aid was something to collect just as much as it was something to drink. These days every package tends to look pretty much the same, save for the obvious color differences. I really wish they would return to the days when Kool-Aid Man would ride pink sharks (Sharkleberry Fin) or party with a purple brontosaurus (Purplesaurus Rex). Peach Mango has the misfortune of coming in the same lame package that every other flavor of Kool-Aid is sold in these days. Does it end up hurting the appeal of Peach Mango? A little. If this flavor only sticks around for a couple months it is going to be tough to remember it because there is almost nothing remarkable about how it looks or how it was sold. I will always bee a Kool-Aid traditionalist. Cherry is my number one pick above anything else but I enjoy the other flavors from time to time too. Peach Mango is a good 'alternative' flavor. I do not think it will be something that will work its way into a regular rotation but I can make due with the five or six packages that I have laying around. The first thing you'll notice about Peach Mango is the smell. As soon as you open the bag you are hit with the strong smell of peaches. Its almost like opening a Glade Air Freshener for the first time and being hit with that overwhelming sent that has been kept inside. I am pretty sure this is the strongest smelling flavor of Kool-Aid I have ever encountered. Once added to water, it ends up forming a really dark yellow color. Its nice. It reminds me of Halloween. A pitcher of Scary Blackberry sitting next to a pitcher of Peach Mango would totally look like your about to preform some sort of voodoo ritual that results in Pinhead and the rest of the Cenobites coming out of your closet. Only instead of cutting off your flesh, you'll be sitting around drinking Kool-Aid. Because not even Cenobites can resist the temptation of a freshly made pitcher of Kool-Aid. As for the taste? Yea its alright. It is nothing to really write home about, which consequently makes it a little more difficult to write about. It mostly tastes like peaches. As a matter of fact I almost entirely sure that that is the only thing it tastes like. I hate to call the inclusion of "mango" in the title as a simple ruse in order to make the name sound more exciting... but I am pretty sure the word "mango" is only in the title to make the name sound more exciting. Besides does anyone even know what a mango tastes like all by itself? Probably not. This paragraph is horribly constructed, hopefully the Cenobites do not notice. 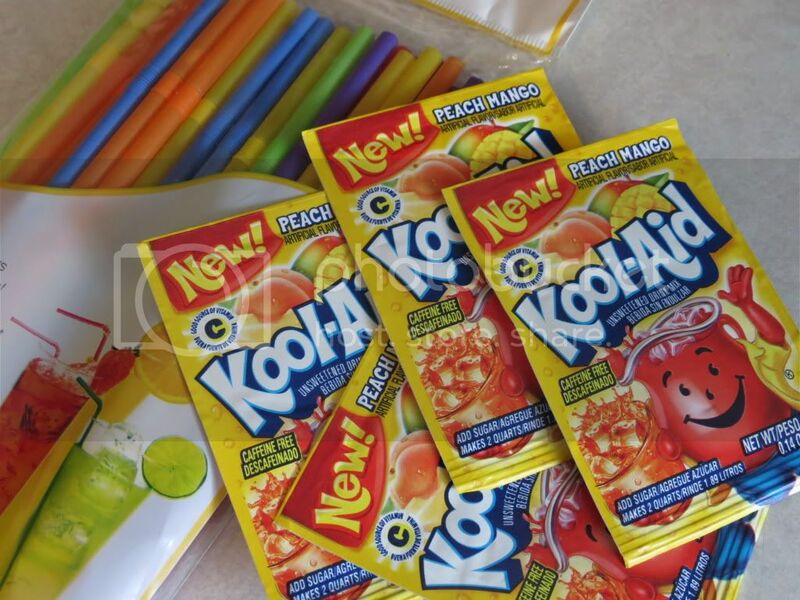 Because I did not think that Peach Mango Kool-Aid was enough for a single blog post, we are going to talk about these colored bendy straws. They are one of the many seasonal summer items that you do not really think of until you see them sitting on the shelf at the store. That tends to be the case with most summer items, they lack the one-two punch that is typically associated with Christmas or Halloween items. But these straws really are an important part of summer lore. They are one of those summer items that we have all used many times before but never really realize it... unless you actually stop and think about it. 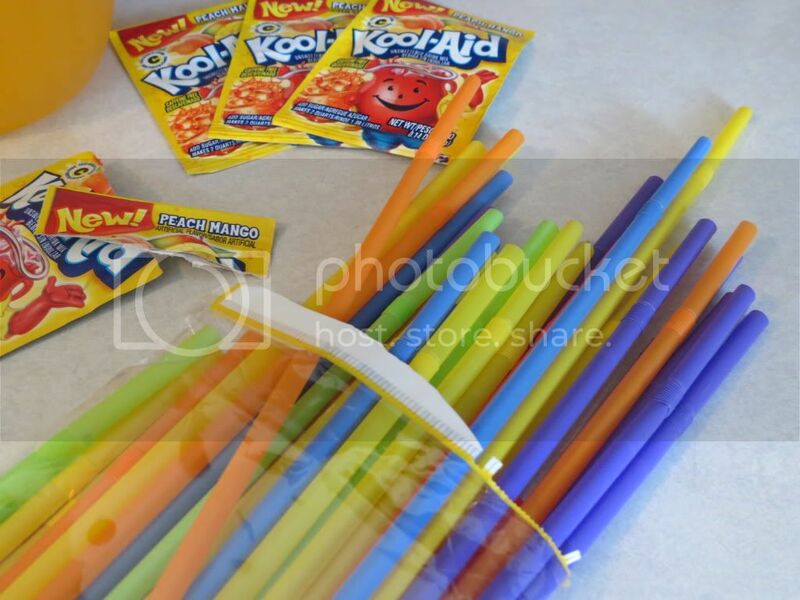 But chances are if you and your friends ever had a lemonade (or Kool-Aid) stand, you used colored bendy straws identical to the ones seen here. I always seem to associate these straws with the 4th of July and family grill outs or long afternoons in the park. They are one of my favorite throw away summer items. Plus any leftover straws can easily be used in a number of different arts and crafts projects. Like creating your own multicolored Hellraiser costume to wear to school when vacation is over. Trust me your parents will love it.